Weather Screen - Natural Biorhythms Calculator and Biorhythm compatibility check. daily horoscopes, natural biorhythms calculator, Web cams, and weather maps to your desktop. According to the theory of natural biorhythms, every human is affected by three basic cycles: Physical, Emotional, and Intellectual. The cycles start at a middle point at birth, and then go up and down over our lifetimes. When the curve of your natural biorhythms is going up, you can better interact in the corresponding arena. The reverse is true during low points of a cycle. Forewarned is forearmed. If you are warned of the downward trend of the biorhythm curve, you can concentrate and perform in the affected area just as well. Weather Screen allows you to enter the date of your birth and see your natural biorhythms over one month period. 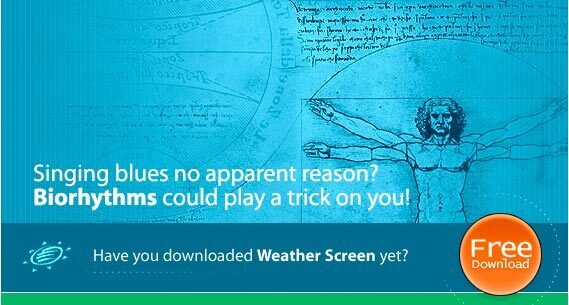 So if you are going to have a big meeting next week, don't forget to download Weather Screen biorhythms calculator and find out how you might feel before it. Here is the scientific background behind the biorhythm theory. Human biorhythms are interconnected with our endocrine systems. What should that mean? The article on natural biorhythms in the famous Encyclopedia Britannica says: Some hormones, for example insulin, are secreted in brief spurts every few minutes. Presumably, the time between spurts is a reflection of the lag time necessary for the insulin-secreting cell to sense a change in blood sugar concentration. Other hormones, particularly those of the pituitary, are secreted in pulses that may occur at roughly hourly intervals. Apparently, pulsated secretion is a necessary requirement for pituitary gonadotropin secretion. When stimulated at about 80-minute intervals by the injection of a hypothalamic gonadotropin-releasing hormone (GnRH), pituitary gonadotropin secretion increases incrementally to high levels. If, however, gonadotrophs are subjected to a continuous, nonpulsatile injection of GnRH, gonadotropin secretion is completely inhibited. Superimposed on these pulsatile secretions are, for many hormones, changes in hormonal levels that occur at roughly 24-hour intervals. These periodic changes are called circadian rhythms (colloq. biorhythms). Take a closer look at the screenshot on the left to see how you can track your natural biorhythm activity and check biorhythm compatibility with your friends and colleagues.